179:0.1 DURING THE AFTERNOON of this Thursday, when Philip reminded the Master about the approaching Passover and inquired concerning his plans for its celebration, he had in mind the Passover supper which was due to be eaten on the evening of the next day, Friday. It was the custom to begin the preparations for the celebration of the Passover not later than noon of the preceding day. And since the Jews reckoned the day as beginning at sunset, this meant that Saturday’s Passover supper would be eaten on Friday night, sometime before the midnight hour. 179:0.2 The apostles were, therefore, entirely at a loss to understand the Master’s announcement that they would celebrate the Passover one day early. 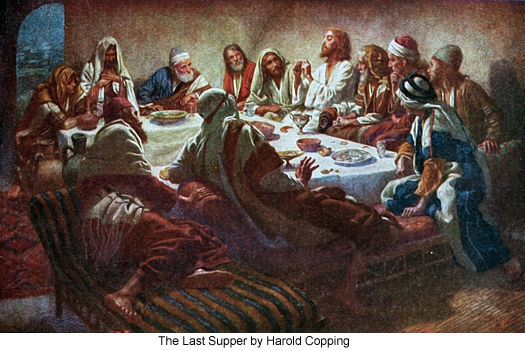 They thought, at least some of them did, that he knew he would be placed under arrest before the time of the Passover supper on Friday night and was therefore calling them together for a special supper on this Thursday evening. Others thought that this was merely a special occasion which was to precede the regular Passover celebration. 179:0.3 The apostles knew that Jesus had celebrated other Passovers without the lamb; they knew that he did not personally participate in any sacrificial service of the Jewish system. He had many times partaken of the paschal lamb as a guest, but always, when he was the host, no lamb was served. 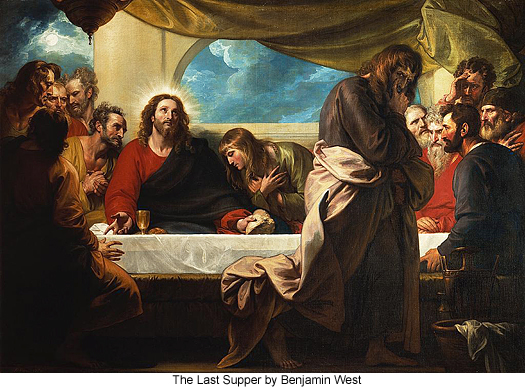 It would not have been a great surprise to the apostles to have seen the lamb omitted even on Passover night, and since this supper was given one day earlier, they thought nothing of its absence. 179:0.4 After receiving the greetings of welcome extended by the father and mother of John Mark, the apostles went immediately to the upper chamber while Jesus lingered behind to talk with the Mark family. 179:0.5 It had been understood beforehand that the Master was to celebrate this occasion alone with his twelve apostles; therefore no servants were provided to wait upon them. 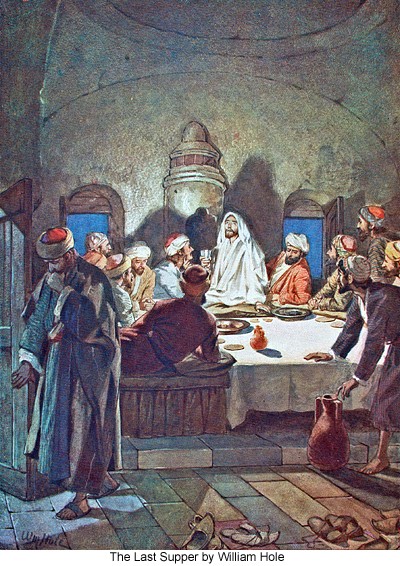 179:1.1 When the apostles had been shown upstairs by John Mark, they beheld a large and commodious chamber, which was completely furnished for the supper, and observed that the bread, wine, water, and herbs were all in readiness on one end of the table. Except for the end on which rested the bread and wine, this long table was surrounded by thirteen reclining couches, just such as would be provided for the celebration of the Passover in a well-to-do Jewish household. 179:1.2 As the twelve entered this upper chamber, they noticed, just inside the door, the pitchers of water, the basins, and towels for laving their dusty feet; and since no servant had been provided to render this service, the apostles began to look at one another as soon as John Mark had left them, and each began to think within himself, Who shall wash our feet? And each likewise thought that it would not be he who would thus seem to act as the servant of the others. 179:1.3 As they stood there, debating in their hearts, they surveyed the seating arrangement of the table, taking note of the higher divan of the host with one couch on the right and eleven arranged around the table on up to opposite this second seat of honor on the host’s right. 179:1.4 They expected the Master to arrive any moment, but they were in a quandary as to whether they should seat themselves or await his coming and depend on him to assign them their places. While they hesitated, Judas stepped over to the seat of honor, at the left of the host, and signified that he intended there to recline as the preferred guest. 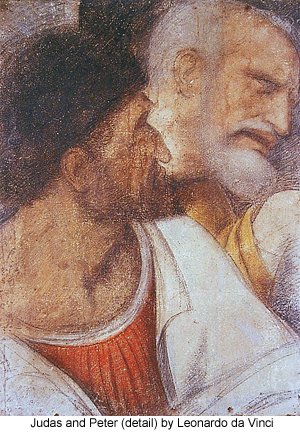 This act of Judas immediately stirred up a heated dispute among the other apostles. Judas had no sooner seized the seat of honor than John Zebedee laid claim to the next preferred seat, the one on the right of the host. Simon Peter was so enraged at this assumption of choice positions by Judas and John that, as the other angry apostles looked on, he marched clear around the table and took his place on the lowest couch, the end of the seating order and just opposite to that chosen by John Zebedee. Since others had seized the high seats, Peter thought to choose the lowest, and he did this, not merely in protest against the unseemly pride of his brethren, but with the hope that Jesus, when he should come and see him in the place of least honor, would call him up to a higher one, thus displacing one who had presumed to honor himself. 179:1.5 With the highest and the lowest positions thus occupied, the rest of the apostles chose places, some near Judas and some near Peter until all were located. They were seated about the U-shaped table on these reclining divans in the following order: on the right of the Master, John; on the left, Judas, Simon Zelotes, Matthew, James Zebedee, Andrew, the Alpheus twins, Philip, Nathaniel, Thomas, and Simon Peter. 179:1.8 They were now ready to begin the supper, except that their feet were still unwashed, and they were in anything but a pleasant frame of mind. When the Master arrived, they were still engaged in making uncomplimentary remarks about one another, to say nothing of the thoughts of some who had sufficient emotional control to refrain from publicly expressing their feelings. 179:2.3 Jesus began thus to talk to his apostles because he knew that his hour had come. He understood that the time had come when he was to return to the Father, and that his work on earth was almost finished. The Master knew he had revealed the Father’s love on earth and had shown forth his mercy to mankind, and that he had completed that for which he came into the world, even to the receiving of all power and authority in heaven and on earth. Likewise, he knew Judas Iscariot had fully made up his mind to deliver him that night into the hands of his enemies. He fully realized that this traitorous betrayal was the work of Judas, but that it also pleased Lucifer, Satan, and Caligastia the prince of darkness. But he feared none of those who sought his spiritual overthrow any more than he feared those who sought to accomplish his physical death. The Master had but one anxiety, and that was for the safety and salvation of his chosen followers. And so, with the full knowledge that the Father had put all things under his authority, the Master now prepared to enact the parable of brotherly love. 179:3.1 After drinking the first cup of the Passover, it was the Jewish custom for the host to arise from the table and wash his hands. Later on in the meal and after the second cup, all of the guests likewise rose up and washed their hands. Since the apostles knew that their Master never observed these rites of ceremonial hand washing, they were very curious to know what he intended to do when, after they had partaken of this first cup, he arose from the table and silently made his way over to near the door, where the water pitchers, basins, and towels had been placed. And their curiosity grew into astonishment as they saw the Master remove his outer garment, gird himself with a towel, and begin to pour water into one of the foot basins. 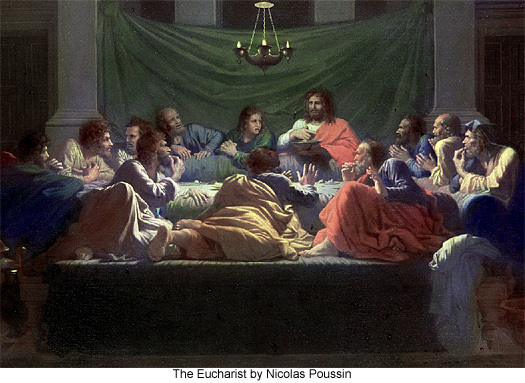 Imagine the amazement of these twelve men, who had so recently refused to wash one another’s feet, and who had engaged in such unseemly disputes about positions of honor at the table, when they saw him make his way around the unoccupied end of the table to the lowest seat of the feast, where Simon Peter reclined, and, kneeling down in the attitude of a servant, make ready to wash Simon’s feet. As the Master knelt, all twelve arose as one man to their feet; even the traitorous Judas so far forgot his infamy for a moment as to arise with his fellow apostles in this expression of surprise, respect, and utter amazement. 179:3.2 There stood Simon Peter, looking down into the upturned face of his Master. Jesus said nothing; it was not necessary that he should speak. 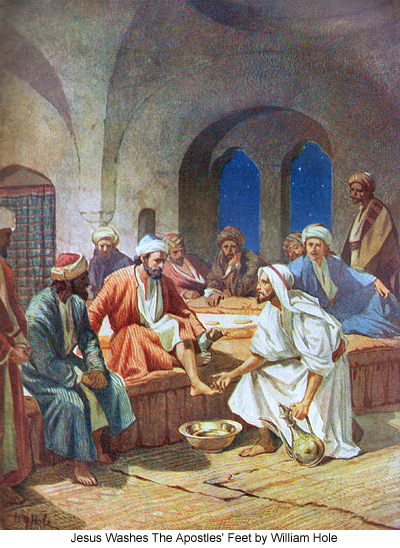 His attitude plainly revealed that he was minded to wash Simon Peter’s feet. Notwithstanding his frailties of the flesh, Peter loved the Master. This Galilean fisherman was the first human being wholeheartedly to believe in the divinity of Jesus and to make full and public confession of that belief. And Peter had never since really doubted the divine nature of the Master. Since Peter so revered and honored Jesus in his heart, it was not strange that his soul resented the thought of Jesus’ kneeling there before him in the attitude of a menial servant and proposing to wash his feet as would a slave. When Peter presently collected his wits sufficiently to address the Master, he spoke the heart feelings of all his fellow apostles. 179:3.3 After a few moments of this great embarrassment, Peter said, “Master, do you really mean to wash my feet?” And then, looking up into Peter's face, Jesus said: “You may not fully understand what I am about to do, but hereafter you will know the meaning of all these things.” Then Simon Peter, drawing a long breath, said, “Master, you shall never wash my feet!” And each of the apostles nodded their approval of Peter’s firm declaration of refusal to allow Jesus thus to humble himself before them. 179:3.4 The dramatic appeal of this unusual scene at first touched the heart of even Judas Iscariot; but when his vainglorious intellect passed judgment upon the spectacle, he concluded that this gesture of humility was just one more episode which conclusively proved that Jesus would never qualify as Israel’s deliverer, and that he had made no mistake in the decision to desert the Master’s cause. 179:3.8 “Do you really understand what I have done to you? You call me Master, and you say well, for so I am. If, then, the Master has washed your feet, why was it that you were unwilling to wash one another’s feet? What lesson should you learn from this parable in which the Master so willingly does that service which his brethren were unwilling to do for one another? Verily, verily, I say to you: A servant is not greater than his master; neither is one who is sent greater than he who sends him. You have seen the way of service in my life among you, and blessed are you who will have the gracious courage so to serve. But why are you so slow to learn that the secret of greatness in the spiritual kingdom is not like the methods of power in the material world? 179:4.3 And when Jesus had thus spoken, they all began again to ask, “Is it I?” And as Judas, sitting on the left of his Master, again asked, “Is it I?” Jesus, dipping the bread in the dish of herbs, handed it to Judas, saying, “You have said.” But the others did not hear Jesus speak to Judas. John, who reclined on Jesus’ right hand, leaned over and asked the Master: “Who is it? We should know who it is that has proved untrue to his trust.” Jesus answered: “Already have I told you, even he to whom I gave the sop.” But it was so natural for the host to give a sop to the one who sat next to him on the left that none of them took notice of this, even though the Master had so plainly spoken. But Judas was painfully conscious of the meaning of the Master’s words associated with his act, and he became fearful lest his brethren were likewise now aware that he was the betrayer. 179:4.6 When Jesus had thus spoken, leaning over toward Judas, he said: “What you have decided to do, do quickly.” And when Judas heard these words, he arose from the table and hastily left the room, going out into the night to do what he had set his mind to accomplish. When the other apostles saw Judas hasten off after Jesus had spoken to him, they thought he had gone to procure something additional for the supper or to do some other errand for the Master since they supposed he still carried the bag. 179:4.8 This supper, with its tender episodes and softening touches, was Jesus’ last appeal to the deserting Judas, but it was of no avail. Warning, even when administered in the most tactful manner and conveyed in the most kindly spirit, as a rule, only intensifies hatred and fires the evil determination to carry out to the full one’s own selfish projects, when love is once really dead. 179:5.3 When they had finished drinking this new cup of remembrance, the Master took up the bread and, after giving thanks, broke it in pieces and, directing them to pass it around, said: “Take this bread of remembrance and eat it. I have told you that I am the bread of life. And this bread of life is the united life of the Father and the Son in one gift. The word of the Father, as revealed in the Son, is indeed the bread of life.” When they had partaken of the bread of remembrance, the symbol of the living word of truth incarnated in the likeness of mortal flesh, they all sat down. 179:5.4 In instituting this remembrance supper, the Master, as was always his habit, resorted to parables and symbols. He employed symbols because he wanted to teach certain great spiritual truths in such a manner as to make it difficult for his successors to attach precise interpretations and definite meanings to his words. In this way he sought to prevent successive generations from crystallizing his teaching and binding down his spiritual meanings by the dead chains of tradition and dogma. In the establishment of the only ceremony or sacrament associated with his whole life mission, Jesus took great pains to suggest his meanings rather than to commit himself to precise definitions. He did not wish to destroy the individual’s concept of divine communion by establishing a precise form; neither did he desire to limit the believer’s spiritual imagination by formally cramping it. He rather sought to set man’s reborn soul free upon the joyous wings of a new and living spiritual liberty. 179:5.5 Notwithstanding the Master’s effort thus to establish this new sacrament of the remembrance, those who followed after him in the intervening centuries saw to it that his express desire was effectively thwarted in that his simple spiritual symbolism of that last night in the flesh has been reduced to precise interpretations and subjected to the almost mathematical precision of a set formula. Of all Jesus’ teachings none have become more tradition-standardized. 179:5.6 This supper of remembrance, when it is partaken of by those who are Son-believing and God-knowing, does not need to have associated with its symbolism any of man’s puerile misinterpretations regarding the meaning of the divine presence, for upon all such occasions the Master is really present. 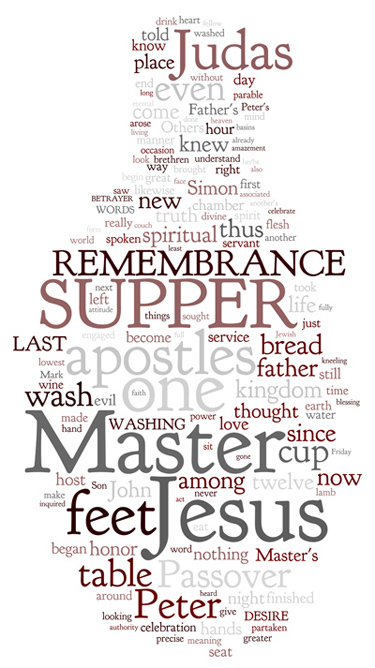 The remembrance supper is the believer’s symbolic rendezvous with Michael. When you become thus spirit-conscious, the Son is actually present, and his spirit fraternizes with the indwelling fragment of his Father.